Of course you can grow Roses! I’ve tried and tried to add roses to my garden. I’ve put them in sun, I’ve put them in shade, I’ve planted them all together, I’ve interspersed them with other plants, I’ve tried hybrids, I’ve tried tea-roses — nothing ever grows properly! Several years ago, I was having moderate success buts, after a hard winter, I went out to find that my rose bushes had been eaten to the ground (thorns and all) by very hungry rabbits. How can you not want that beautiful color and fragrance, though, so I keep trying! For help, though, I’m now turning to the experts for advice. One of the most beautiful rose gardens in our region is located in what you might call a difficult rose growing area. The Leif Erickson Public Rose Garden in Duluth, MN is a zone 3 or 4. The rose garden features many different varieties, from species rugosa to hybrid tea roses. Hardy rose hedges line walkways, and a planting of hardy shrub roses near the entrance welcomes the 100,000-plus yearly visitors to the garden. Water regularly, especially during hot summer days. Most experts recommend about 1 inch of water per week. When watering, make sure to soak the base of the plant, keeping water away from the leaves. Feed your roses using an all-purpose slow-release fertilizer, or a fertilizer specially designed for roses. Be sure to follow label directions. Roses can thrive in a large container. Be sure to keep the planter evenly moist and fertilize regularly. New Dawn (pink) – 18 to 20 ft. Winner Circle (red) – 18 to 20 ft. Autumn Sunset (yellow double) – 8 to 12 ft.
To keep roses blooming throughout the growing season remove spent flowers (deadheading). This transfers the plant’s energy back into creating stronger roots and even more blooms. Trim down to the first or second five-leaflet leaf. It’s hammock season and this book will make you forget that you wanted to thin those perennials or move that shrub. If it’s horticultural enlightenment that you seek, this is not the book for you. It was published in 2008 so if you missed it, it’s worth going back to pick up. The story crosses three generations beginning with a four year old girl named Nell on a ship traveling from London to Brisbane, Australia. Curious thing is, she is alone. Near the very end we find out why. Over the time span of almost a century, we search for her roots along with her granddaughter Cassandra who travels to London to investigate the family tree. Growing metaphors aside, you’ll want to keep track of the year noted at the beginning of each chapter. Mystery abounds in many directions as we follow the back and forth of Nell. The unintended sting of finding out that she was left on the dock, brought home and raised by a kindly dock worker and his wife, her eccentricities, and the distance that she feels not knowing her origins weave a secretive and gripping tale. 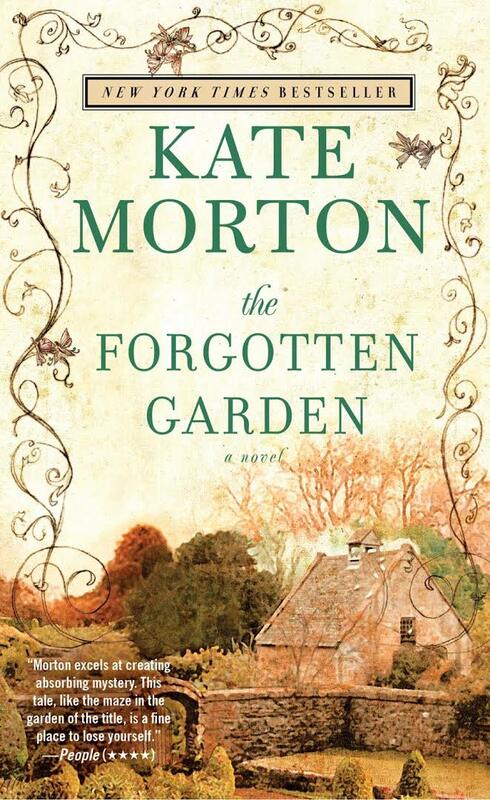 Cassandra learns more about the origins of her grandmother Nell after her death when she realizes that she has inherited Nell’s cottage in London. It takes a while for her to discover the garden. It is truly forgotten and the estate which housed it has plenty of its own secrets which are chilling and heartbreaking at the same time. Certainly our gardens have history, but hopefully none like this one. You’ll like the characters Morton has created, well most of them anyway. Sweetness, bitterness, selfishness and love make these 550 pages fly. Make sure your hammock cradles you for The Forgotten Garden. Join us at the Farm Market! Not only do we provide service to the community, but this is a fun opportunity for Outagamie County Master Gardeners to get to know their fellow MGs better. 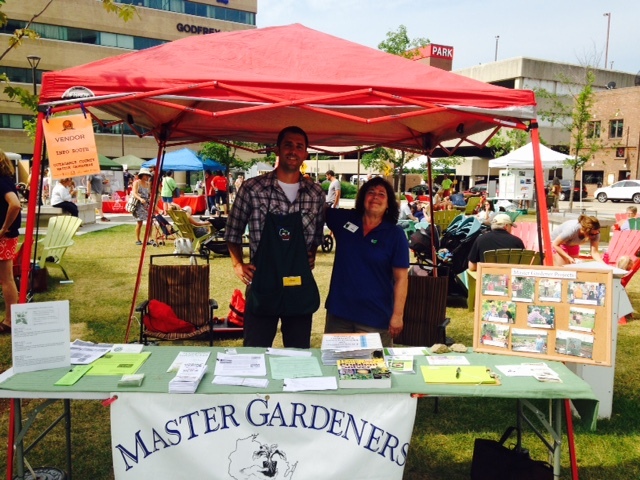 Outagamie County Master Gardeners have been staffing a booth at the Appleton Farm Market for many years. Providing this service to the community has been a tradition in almost every state by Master Gardener groups. This year the OCMGA is continuing the tradition starting June 25 and then on the second and fourth Saturday of each month through September and possibly October. The Appleton Farm Market Coordinator has again generously given us space for free in Houdini Plaza with other program type booths. The Saturday Downtown Appleton Farm Market is the third largest outdoor farm market in Wisconsin after Madison and Milwaukee. The Farm Market will open on June 18 and continue each Saturday through October with over 150 vendors. Volunteers at the 2015 booth have come up with a number of great ideas to increase traffic and draw in the public. These ideas range from having freebies like seed packs or fruit to dressing up the booth with plants to having a monthly theme. Ideas are always welcome. In 2015 we staffed our booth once per month and in 2016 we are going back to twice per month. We had a wonderful group of volunteers in 2015 who I hope will return in 2016. Some were veterans and many were from the class of 2015. We will also be recruiting from this year’s class. One of the keys to success will be recruiting plenty of volunteers to be part of our team. This is a very fun and rewarding way to provide service to the community and earn service hours. Our friend and Master Gardener Lucy Valitchka has been successfully growing vegetables longer than many of our members have been gardening. 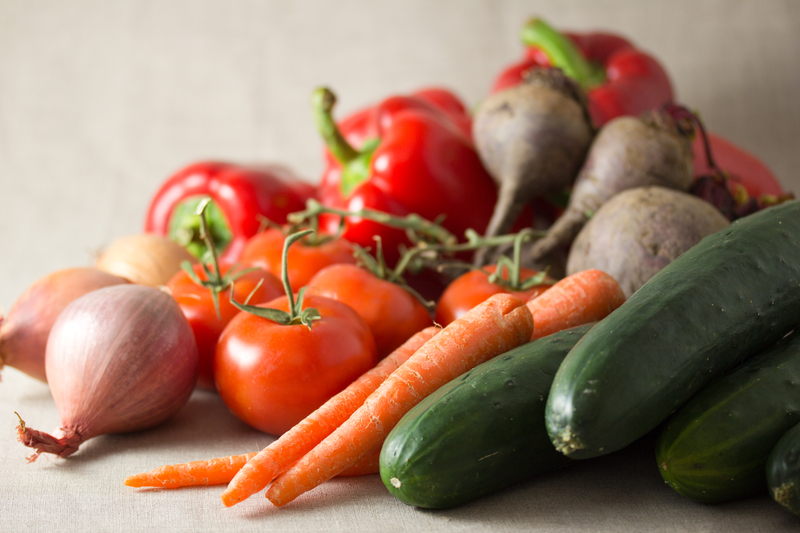 Each year, we ask Lucy to teach our new class the section on Vegetables, and she also graciously supplies an article for our Summer Newsletter. Because that information is too valuable to keep to ourselves, we’re reprinting it here. “During the growing season gardeners know that timing of jobs in the garden impact the final produce harvested. That is the reason behind these calendar jobs listed in each newsletter. Maybe some people remember it easily, but I need a reminder just to make sure the job gets done in time. For new readers of this column, I try to include a calendar of garden tips for each month. This is taken from Madison Area Master Gardener’s Association garden journal no longer published. Control anthracnose and other disease problems by staking plants, maintaining optimal plant spacing and using mulches. Tie tall crops, such as tomatoes, or cage them, to support as they grow. Start seedlings of brussels sprouts to transplant in mid July. Plant peppers, eggplants, sweet potatoes and late potatoes. Plant successive crops of beans, beets, carrots, kohlrabi, corn, turnips, broccoli, cabbage and cauliflower. As soil warms apply a mulch after deep watering or heavy rain. Control leaf blight on tomatoes by disposing of diseased foliage or plants immediately or planting disease-resistant varieties. Control cabbage worm and cabbage looper on cabbage, cauliflower and broccoli. Thin vegetables for proper spacing. Plant rutabagas, late cabbage, cauliflower and broccoli. Mulch tomatoes and water them, if necessary. Stop harvesting asparagus. Weed asparagus bed carefully after harvesting to avoid damage to roots. Renew mulch if it starts to decompose. Make daily inspections for pests, and treat, if necessary. Control garden weeds to prevent them going to seed. Harvest onions, garlic, and early potatoes when tops begin to shrivel. Plant lettuce and spinach for fall crop. Pre-germinate seeds on moist towel, or plant deeper than spring planting. Mulch thinly. Watch for squash vine borer. 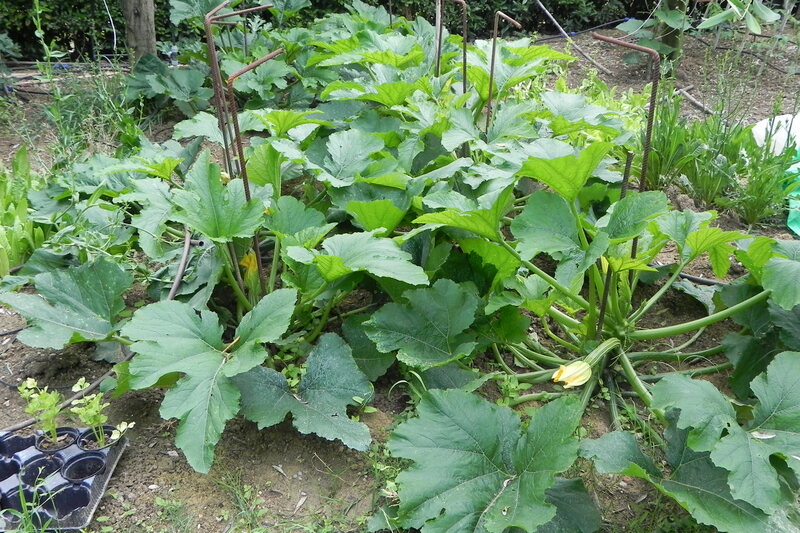 Remove floating row covers from cucumbers and melons as soon as they begin to bloom so that they can be pollinated. Use a reflective mulch such as aluminum foil to repel squash vine borers. Plant collards, kale, bunching onions and cucumbers for fall harvest. Plant beets, Chinese cabbage, rutabagas and turnips for fall harvest. Fertilize asparagus beds. 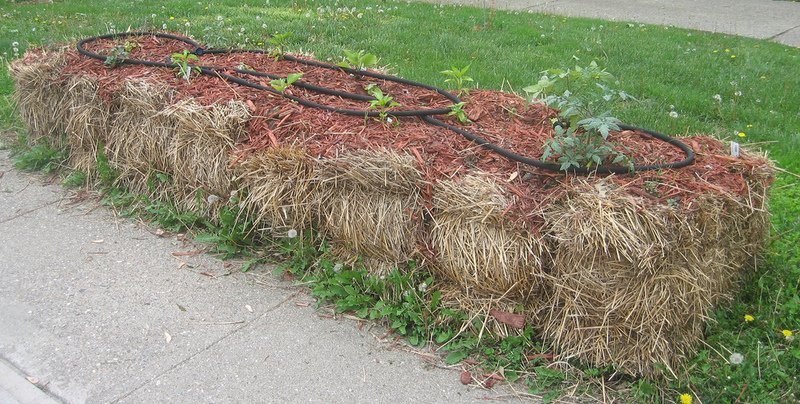 Mulch with straw. Keep tomatoes mulched and watered to prevent blossom end rot. Transplant broccoli, Brussels sprouts, and cauliflower seedlings for fall crop. Plant chard for fall crop. Plant fall crop of peas. Keep plants picked to maintain productivity. Sow cover crops in garden areas not in use. Pick herbs just before blossoms open for best flavor. Inspect corn regularly. Corn pests become abundant in mid-August. Keep eggplant and peppers picked so younger fruit develops. Plant late crops of radishes, lettuce, spinach and beets. 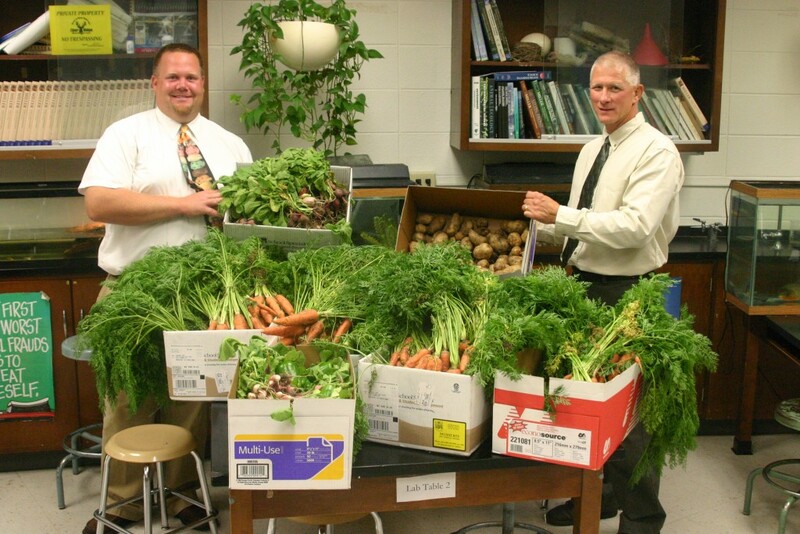 Appleton East High School Grows a Row for St. Joe’s! Fresh produce should be in its whole, natural state — uncut with no signs of mold, spoilage, or severe bruising. The skin should be intact, and it should not be peeled, washed, or processed in any way. Handle fresh fruits and vegetables safely to minimize the risk of food borne illness. Don’t mix produce types. Keep each type in separate, clean, food-grade containers or bags. Clear off as much mud and dirt as possible from the produce you plan to donate. Please do not wash the produce to help maintain its freshness. Choose produce that has no signs of mold, spoilage, bruising, or insects. It is recommended that harvesting of produce is done early in the morning. If it’s covered with dew, dry it with paper towels. Inspect each item for serious bruising, insect damage, or over-ripeness. Don’t donate produce that you wouldn’t buy or use for your own family. If you use pesticides in your garden, always read and follow the label recommendations carefully. Pay particular attention to the time to when you should harvest after the last use of the pesticide. If you are not absolutely sure that you followed the label when using pesticides, the food should not be eaten or donated. For more information about donating food to St. Joe’s Food Pantry, visit the website where you can also find information about the “Plant a Row for St. Joe’s” program. For a new twist on container gardening, try straw bale gardening. This emerging technique skips the container and substitutes partially decomposed straw for potting mix. It starts 11 days before planting after the bales are put in place. Lay them so the string is on the sides and not the bottom. A stake driven in at each end will help hold bales together. Tall stakes can double as end posts for vertical supports to hold vines or tomato plants. Conditioning the bales begins with three days of thorough soaking. For each of the next three days, sprinkle 1 cup of ammonium sulfate or 1/2 cup of urea on top and water soak again. For the next three days, use one-half as much fertilizer. On day 10, simply water. If, on day 11, the bales no longer feel warm on top, you can plant. Otherwise, wait until they cool to body temperature. Transplanting into the bales only requires stabbing into the straw and prying open a space large enough for the roots. To sow seeds for individual plants, pack a little potting mixture into the openings you make, place the seed at the proper depth, cover and add a little mulch to hold moisture and prevent the potting mix from washing away. 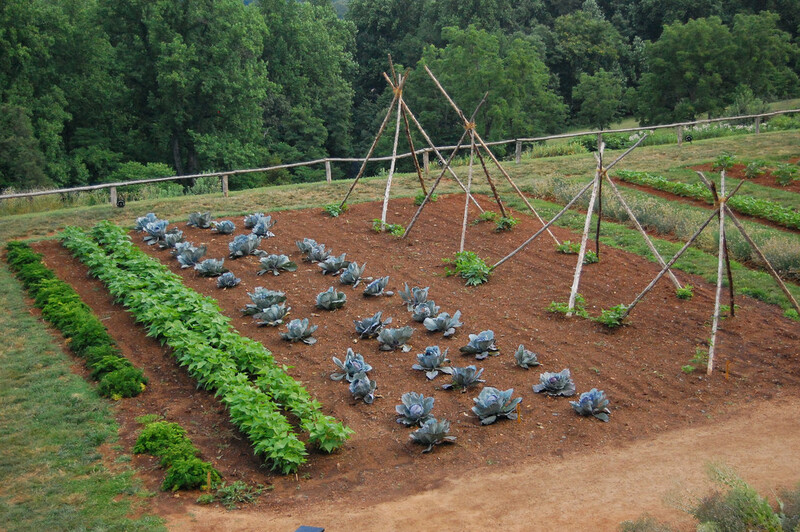 To make rows for crops, such as lettuce or spinach, use your trowel to cut a trench, fill with soil, and plant. The rest is the same as traditional container gardening. Water daily and do not allow bales to dry out. A soaker hose running the length of each bale will make this much easier. Fertilize once a week with a water-soluble, balanced fertilizer.